Deep inside the Northern India lies one of the most humid places on earth. 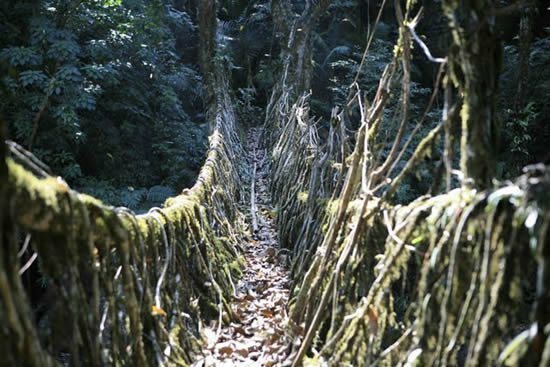 Here the bridges are not built, rather they are grown as tree roots. 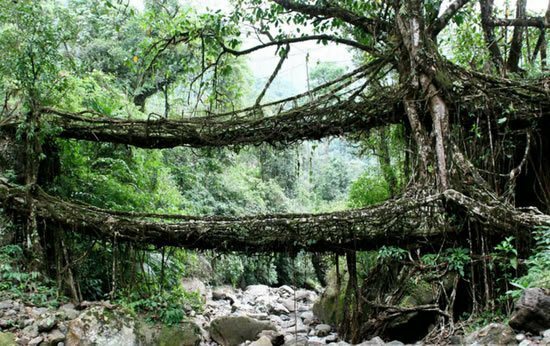 The living bridges in Cherrapunji, India are grown from the trees of Ficus elastica. 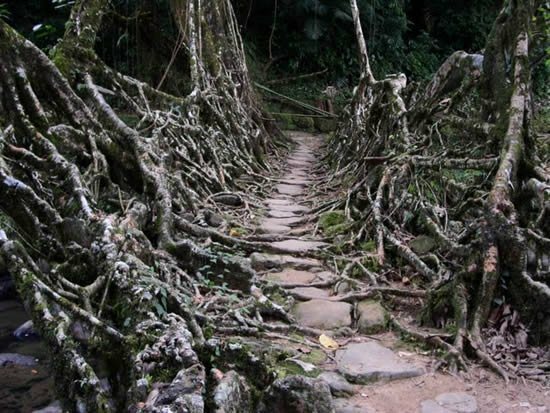 The tree produces a series of secondary roots higher on its trunk, these roots can easily be grown and directed along the huge boulders along the river banks and across the rivers themselves to form the bridges. 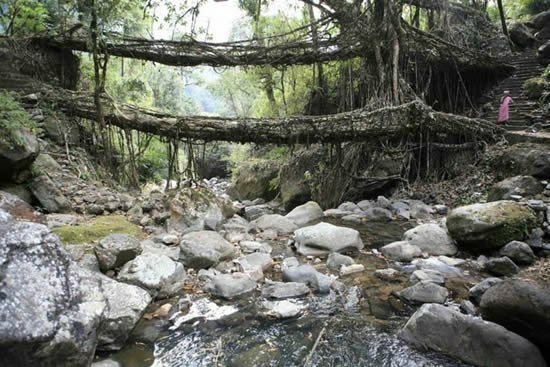 Cherrapunji is also known as the wettest place on earth and lKhasis, a tribe in Meghalaya, noticed the powerful roots of these trees and used them to make bridges on the rivers in the region. These roots are thin and tender and can easily be directed in the desired direction. 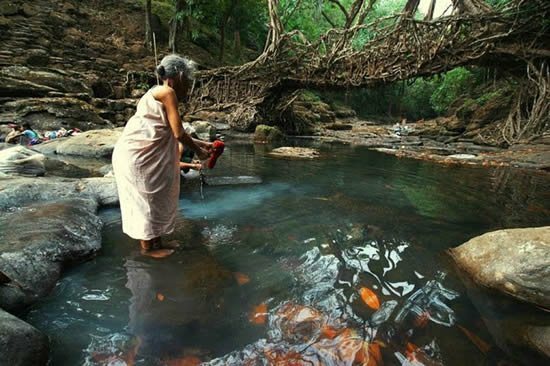 Wherever they need, they grow these bridges. In order to make the roots of the true tree Ficus elastica in the right direction. They use trunks that are sliced from the middle to create a root guidance systems. 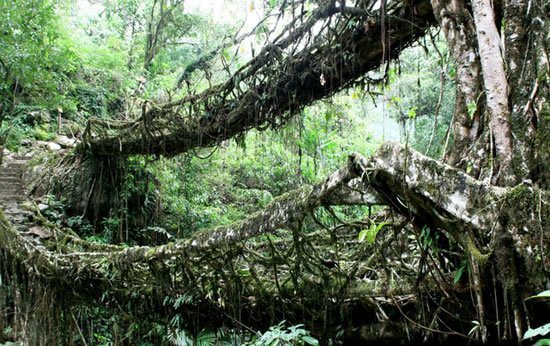 Over the time, as the roots strengthen themselves strong and sturdy living bridges are produced. Some of these bridges are even more than a hundred feet long and can take ten to fifteen years to become fully functional. However, they are extraordinarily robust and strong enough that some of them can support the weight of fifty people at a time because they are alive and growing. 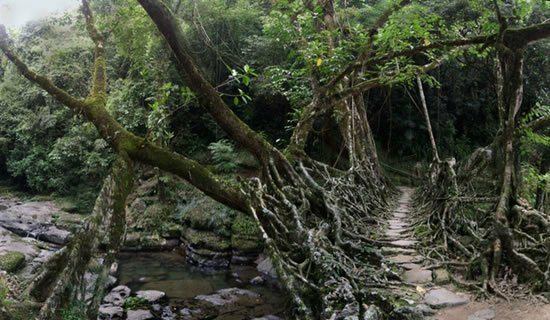 Bridges gain strength over time – and some of these root bridges are used daily by the people of the villages around Cherrapunji for more than five hundred years.